This image from the APEX telescope, of part of the Taurus Molecular Cloud, shows a sinuous filament of cosmic dust more than ten light-years long. Image released Feb. 15, 2012. 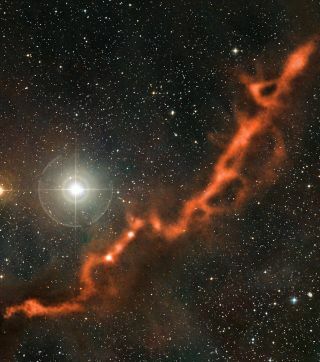 A European telescope has spotted a vast tendril of cosmic dust reaching across a dense cloud in deep space. The huge, tentacle-like filament of dust is more than 10 light-years long and is anchored to the so-called Taurus molecular cloud, which is about 450 light-years from Earth in the constellation Taurus (the Bull). The cloud and filament are filled with newborn stars that are hidden from view by interstellar dust, according to an image description. Astronomers used a high-tech radio telescope in Chile run by the European Southern Observatory (ESO) to photograph the Taurus cloud filament. The dusty tendril actually consists of two parts, called Barnard 211 and Barnard 213, which take their names from an early 20th-century photo atlas of similar filaments by astronomer Edward Emerson Barnard. "In visible light, these regions appear as dark lanes, lacking in stars. Barnard correctly argued that this appearance was due to 'obscuring matter in space,'" ESO officials explained in a description accompanying the photo's release today (Feb. 15). "We know today that these dark markings are actually clouds of interstellar gas and dust grains. The dust grains — tiny particles similar to very fine soot and sand — absorb visible light, blocking our view of the rich star field behind the clouds." Two bright stars also stand out in the new image, but both are in the foreground and are thus closer to Earth than the Taurus molecular cloud. These two images are of the same part of the Taurus Molecular Cloud, about 450 light-years from Earth. Its relative closeness makes it an ideal place to study the formation of stars. The dramatic comparison shows how clouds of cosmic dust grains appear dark and obscuring when observed with visible light (left image), but are seen to glow when observed with light of wavelengths around one millimeter (right image). The observations on the right were made with the LABOCA camera on the APEX telescope. The upper-right part of the dusty filament shown here is known as Barnard 211, while the lower-left part is Barnard 213. Image released Feb. 15, 2012. The Taurus cloud appears extra dark when observed with visible-light telescopes because its dust is extremely cold, with an average temperature of around minus 441 Fahrenheit (minus 263 Celsius). The region can only be observed well at millimeter or submillimeter wavelengths, which are up to 1,000 times longer than those of visible light. To observe the Taurus molecular cloud, astronomer Alvaro Hacar of the Observatorio Astronómico Nacional-IGN in Madrid, Spain, and his colleagues used ESO's Atacama Pathfinder Experiment (APEX) telescope in northern Chile. APEX is a 40-foot (12-meter) prototype designed to test technology needed for a next-generation submillimeter telescope called the Atacama Large Millimeter/submillimeter Array, or ALMA. The $1.3 billion ALMA observatory will ultimately be a network of 66 telescopes, each the size of APEX, spread across 11 miles (18 kilometers) on Chile's Chajnantor plateau and perched at an elevation of about 16,500 feet (5,000 m). Last October, astronomers released the first image from the still-incomplete telescope array.